If we accept the truth that we have the power to choose how we will let our past experiences influence us, then it's just a matter of deciding if we will act upon that knowledge and understanding. To not act, to remain where we are, to continue to allow ourselves to be pressed down from rising to our full potential is a choice. If this path is chosen, then what hope can we have to live differently? To not intentionally move forward into something new is a choice to let the past continue defining who you are and what you are capable of. BUT if we accept this truth, though it may be a daunting proposition, we are then free to see what this life has to offer and to explore what lies beyond who we are now. To use a popular phrase, we are then free to get outside of our "comfort zone". The safety of the comfort zone is just a feel-good way of saying it's ok to live in fear. 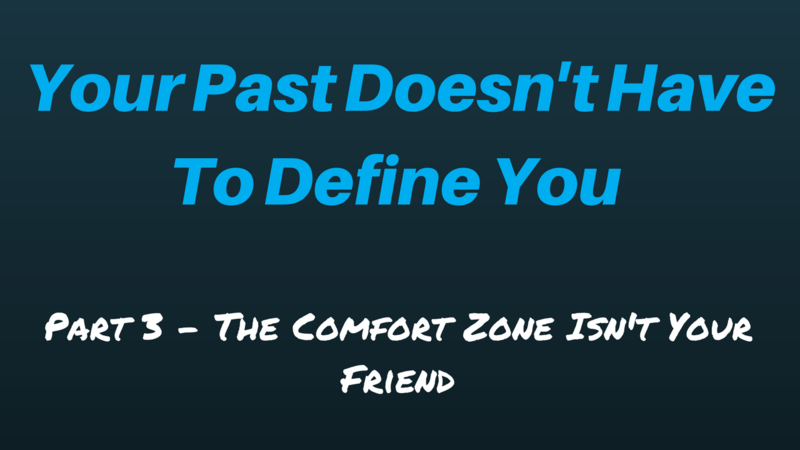 To truly accept that our past does not have to define who we are or who we will be, we must intentionally choose to push past the boundaries of where we are comfortable. Though we may like to think otherwise, the comfort zone isn't a friend. It's a master that offers no allowance for becoming more or achieving more. Only by taking new "risks" (just a way of saying trying new things that make us uncomfortable or we can't control the outcome) will we test ourselves and see just what we can do and truly live in a way that seeks to rise to the fullness of the potential with which we were created. For me, this began to be played out after a family trip to Disney World around the end of my senior year in high school. Through engaging a cast member in discussion, I was made aware that Disney offers a College Program whereby college students can apply to work at the Disney World Resort for a semester while also being exposed to Disney business training. This puts you into a whole new world where you'll be living with people you've not previously met at the exclusive housing complex just for program participants and being exposed daily to new situations and people from all over the world! I was interested and decided it was something I wanted to pursue. That decision alone was a big step for me as someone who traditionally lacked the confidence to put myself into new and uncomfortable situations, but something about the opportunity got me really focused on how best to get accepted to participate. Over the next year I started working at our local Disney Store which was great preparation for having to meet and talk with new people from all walks of life. To be part of that team, there was no option to be reserved, shy, and avoid interaction. We were expected to be energetic and engaging, converse with store guests, and be confident in our brand knowledge or at least how to find out answers to guest questions. That was a year of great growth in me personally by thrusting myself into something completely new. The timing worked out for me to apply for the Disney College Program and I was accepted. While working at the Disney Store was a new personal challenge, there was still an element of safety because it was in my hometown and an area in which I felt comfortable. Leaving for several months, to go hundreds of miles away, to live with people I didn't know, and work at the Walt Disney World Resort was a new, exciting, and confidence stretching opportunity and fortunately I did not back down. The growth that I'd begun experiencing helped me decide it was worth the risk to try something new like this. Over the four months of the College Program, my lack of self-confidence was challenged daily and through that I built belief in myself and my abilities. I also built relationships and made new friends from all over the country, truly began to learn what living on your own meant, and even ended up meeting the woman who would become my wife just two years later! After that experience, I was much less intimidated to meet new people, take on certain responsibilities that put the focus on me, and be in new social situations. If I had never made the decision to do something different I would have never had that experience. If I had never decided that it was worth the risk to get out of my comfort zone I would never have been put in situations that made me learn, grow, and move forward in seeing just what I'm capable of and how to adapt to new things. In our minds, our world can be so small and seemingly insignificant. In reality, the world is a huge place, with new people and new experiences just waiting to come into the realm of your awareness. We may think we have nothing to offer those around us, but when we are willing to go beyond where we are comfortable we will find that other people appreciate us for who we are and that we can have a positive impact on their lives. The journey to moving past the potentially defining experiences of our past and into becoming all we're capable of is an ongoing process. When we think we've grown, we've just really given ourselves a new comfort zone. We must keep pushing ourselves forward. There's more to come. There are paths we'll have the chance to take that we know nothing about until we come upon them. Those moments are our new opportunities to continue our growth, to continue becoming who we're created to be. My growth has continued from that College Program experience over 20 years ago. More on that next time.